"[T]here is no faster way to a society in which race doesn’t matter than to stop talking and acting as if it does." The sooner we resolve to abandon the labels "black" and "white," the sooner we will be a society in which such racial labels are irrelevant. And what better moment to make such a resolution than this one, when white Americans by the millions are proving that the color of a person's skin is no longer a bar to anything in this country - not even the presidency. Can we really draw this much from Obama’s cross-racial appeal? Jacoby offers Obama’s success as proof that White voters have finally transcended race. But it might show something less triumphant. Perhaps White voters, some of us at least, see in Obama the hope of racial redemption. 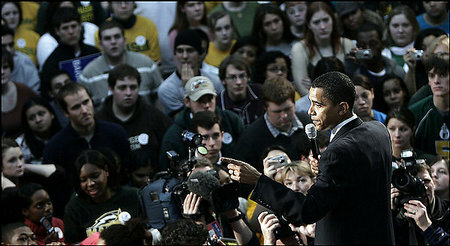 Perhaps we support Obama not because we’ve risen above race, but precisely because we have not. In the words of Dan Payne, maybe we're drawn to Obama because he's a Black politician "who doesn’t talk about discrimination, thus absolving white people of guilt for the prejudices he undoubtedly faced." California schools with a high concentration of Black and Latina students are 74% more likely to lack textbooks for homework, 73% more likely to have cockroaches, rats or mice, and 300% more likely to have problems with teacher turnover than mostly White schools. NY schools suspend poor and minority students at a disproportionately higher rate than White students for the same infractions. White professionals fill nearly 80% of New York City’s high paying administrative and managerial jobs, and while Blacks, Latinas and Asians together make up 57% of the City’s workforce, they are only 19% of the City’s senior and executive agency staff. The majority of New York teens arrested for marijuana possession are Black and Latina, yet according to the City’s own statistics, Whites are more likely than Blacks to use illegal drugs including marijuana. In Chicago, 26 alleged murder suspects, nearly all of them non-white, remain incarcerated despite evidence that Chicago police officers engaged in systematic torture and abuse during interrogations. No officer involved in these incidents has ever been prosecuted. In Los Angeles, Black motorists are significantly more likely than White motorists to be asked by police to step out of their vehicles and submit to a search. Infant mortality rates are 2 ½ times greater for Blacks, and 1 ½ times greater for Native Americans than for Whites. Obama may very well be the right candidate with the right policies at the right time to turn these statistics around. But that won’t happen unless White voters who support him now make a serious and sustained break with the past and own up to our present reality. Electing a Black President may well be a necessary first step. But it is only a first step. And so long as we live in a society in which race does matter, we have to stop talking and acting as if it doesn’t. Race does matter, but class matters more, and it's not clear that in a post-Edwards campaign, class and poverty have the place that it should in the discussion. I haven't read the reports, so I don't know if they are sophisticated enough to have controlled for the variables of class and income, but the ACLU report is almost certainly tied to money, the fact that Blacks and Latinos are not in management positions is likely tied in large part to lack of educational opportunities for people in those communities (i.e. money), and infant mortality rates simply have to be class-based (if they're not, then what we're saying is that some races have a higher genetic disposition to infant death, which is silly, because race isn't genetic).